We are the Gurmat Gian Group. 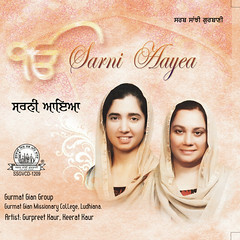 We are comprised of young Sikh women musicians and our prime purpose is to sing Gurbani. We share among many things a common last name that is “Kaur”. Kaur if you would know means The Princess and The Lioness. We got this name because we are daughters of Guru Gobind Singh Sahib Ji. Him being the King and the Lead Lion. Gurmat Gian Group which in itself means somewhat like The Gurbani Philosophical Knowledge Sharing Group. And we wish to share with everyone the Wonder of Gurbani Kirtan. This Group is conducted by Gurpreet Kaur. She is the main force behind all the compositions and training the other members. Keerat Kaur too has composed many tunes. Members of the group keep changing. 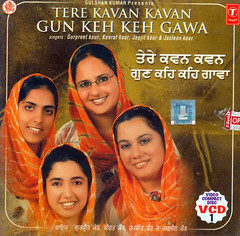 Gurpreet Kaur and Keerat Kaur being permanent singers in this group. At present this group consists of two women singers. Gurpreet Kaur who happened to be the sole power behind the Gurmat Gian Group left this world after completing her journey of this life as destined by the Almighty. She was diagnosed with a Brian Tumour in the month of April 2015 for which she under when treatment and as Waheguru ji desired she left this world on 12th Sept 2016. She breathed last at Baltimore USA. 1. 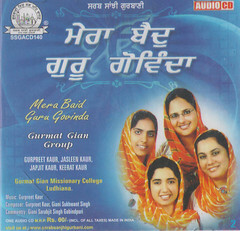 Gurpreet Kaur Gurpreet Kaur is the conductor of this group. She teaches Gurbani Keertan/Sangeet to students of all ages. She is incharge of Gurmat Sangeet wing of Gurmat Gian Missionary College Ludhiana. Currently, she is based in Raikot, Ludhiana, Punjab.Contact: Email: gurpreetkaurmail@gmail.comc/o Dr. Manbir Singh. Cell: +91 9888 888 3932. Keerat Kaur Keerat Kaur is an important member of the group. She besides being an esteemed musician is a Computer Engineer. She is presently based in Atlanta, U.S.Contact: Email: keeratk@gmail.comSome other Musicians who are important contributers in our recordings. Sonu Khanna, Director Music Instruments Sandeep Singh, Dilruba Player Paramjot Singh, Tabla Player. (of the Guinness Book of World Records of marathon tabla playing). Swaran, the Sound Recordist. He makes our singing sound better. Jaganpreet Singh, Tabla Player. Rana Inderjit Singh Cell: +91 9814635655ranais40@gmail.comHe is the chairman of the Gurmat Gian Missionary College, Ludhiana.Gurmat Gian Missionary College, Ludhiana.Punjabi Bagh, Jawaddi, Ludhiana. 141 013. Punjab. INDIA+91 161- 2521700, 5004081, Fax: 161-2521700gurmatgian@rediffmail.comWe are highly thankful to all those who keep giving us useful suggestions in relation to Gurbani, translations and various aspects of this Blog including layout and other helpful guidelines.Feel free to contact us about any feedback, suggestion etc.Anything you think we should/must know. Anything you feel like telling us.Just anything….Use our contact form for this purpose or contact at any of the above addresses. Contact Form. This is a truly commendable seva on the part of your Group. The singing is melodious and we wish you all the best for the future. your continuing growth and popularity. Unbelievable…inspiring…exceptional…melodious….beautiful… charming…. soothing……mind blowing…beyond limits….. Guru Sahib ji’s Gurbani sung by beautiful Gursikh Bibian who have talent and have the courage to do Gurbani parchar through this great media. Panjis, I am totally inspired by the beautiful Keertan that you have put up on the website. I would love to have audio recordings of these shabads. Is it possible for you to put up those online? May Guru sahib ji bless you with more keertan and beautiful voices so you keep doing seva of the panth in this form. I really really love all of the keertan videos that you have put up. I just do ardas in Guru sahib jis charn for meeting you in person and Guru sahib ji gives you all the success in the world. Waheguru ji ka Khalsa Waheguru Ji Ki Fateh !!! Thanks a lot for the appreciation and all the encouraging words. As for audio recordings being available online, it may be possible in near future. We’ll inform you when its possible. I would like to inform you that Audio recordings of all the Shabad Videos have been put up in the Blog of Gurmat Gian Group. Below every video a link for audio file has been given. You may use this link to hear or download the Shabad. Hope you feel Guru’s Bliss and enjoy Guru’s Bani. its keerat’s mummy here. i thank you for giving my dear daughter such a beautiful gift reciting keertan. i pray to agod to bless you with more kirtan , guru da love nd gursikhi jiwan for the whole of the family. Thanks for the nice words. We all thank Waheguru for making us sing His Praise and in the process getting appreciation from people like you. I am short of words to express my wonderful feelings for the commendable job you are doing . I was simly lost while listening the shabads.I pray to Wahegur that this job which HE has entrusted you should continue without any dilution. I think the mode of presentation should remain as it is . I would love to talk to the concearned person and discuss on phone or in peerson. Hail Bani, our guru, God and his humble Sikhs. 1. Try to reach a wider, non Sikh, world wide audience. They don’t know much about Sikhi,, so customise your information to their needs. That way more people will be drawn to the beauty of Sikhi. 2. Add information on Raag covered, who taught it to your etc, the shabad, the explanation the main idea etc. But do get an expert to explain the meaning in English. Mention the taal too and also have pictures of your whole jatha sitting, the drummers too and how and why you came up with this blog. 3. Have the shabad in gurmukhi,followed by the Romanised version and than the translation-all these in one set. If you like I can help. 41 years old English Language teacher from Singapore. Thanks for liking the Gurbani Kirtan. We would certainly welcome any help that you can extend. At present we are depending on the SikhiToThe Max for all the English translations for the Shabads. We do feel the need of some different translations. Regarding the music compositions, this is done by myself and I train the other members of the group. Some of the Shabads have been composed by Keerat Kaur. We came up with this Blog so as to make the World our Sangat and distribute the Bliss of Gurbani to everyone. Thanks for putting my name on your mailing list. I do not seem to have received such material earlier, which I hope I shall be receiving on a regular basis. I wish the Group well in their endeavour to spread Gurbani through the medium of music. Dont know how you missed earlier mails. We have your mail id in our mailing list. Thanks for visiting this site. Do recommend your near and dear ones and your friends this site and distribute Gurbani’s Bliss to others. Thanks for including my name on your mailing list. I do not seem to have received such material earlier, which I hope I shall be receiving on a regular basis. I wish the Group well in their endeavour to spread Gurbani through the medium of music. MANMUKHS . For details do not hesitate to ask . him , during AMRIT VELA . GURU GOBIND SINGH JI MAHARAJ. overcome pollution ( Loan from USA CO. of RS eight BILLION for 29 years ) of generators , 10 years ago . speak to her soon . waheguru ji ka khalsa … waheguru ji ki fateh … dear sister’s … how many album’s you are done already … let me know … plzz … i wanna get those all alubam’s …. The Online sytem of Cds’ purchase is only for those Outside India. You’ll be sent CDs from USA itself. have a melodious and soothing voice specially in the harmony as a group singing in a classical style. Much much better than many professional ragis. I wish I could also do this SEVA but being alone myself here in this art there is no possibility. Akaal Purukh may bless this family. Truly melodious and beautiful videos. Have downloaded lots of them, but still a long list to go. Wonderful collection. Proud to be in the family. Keep it up! 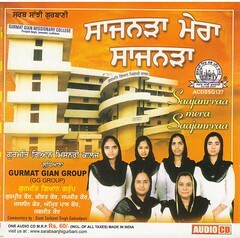 waheguru g ka khalsa waheguru g ki fateh,bro frm were can i download kirtan of this group?any web link? To download the shabads, there is a link in the Audio player situated under the video player. Some shabads pages also have links for download. Impossible to describe in words the sense of peace & tranquility one feels while listening to any shabd sung by Gurmat Gyan Group. You really feel transported to another world. God bless all members of this group so that they can create many more shabds. Thanks for Enjoying the Bliss of Gurbani. And we feel privileged for being part of the process. I do take Gurbni Kirtan Classes one a week at Gurmat Gian Missionary College, Jawaddi, where students of all ages learn Kirtan in classical style. For me, learning Gurbani Kirtan needs vocal training and instruments have only a minor secondary role. Learning Singing & learning Instruments are two different things. For those who have interest in doing Kirtan should not wasting their energy in learning a totally new instrument. I feel Its like riding two boats simultaneously. For students of Vocal Music, there is a need to take help of ‘sur’ and that may be from any instrument, be it taanpura, harmonium or any other. And harmonium is the easiest of all. Once a person has mastered his sur for him it become very easy to start on any new instrument anytime. Could you Please Please sing this Guru Teg Bahudar Ji shabad on in ur upcoming next CDs. & Thanks for singing divine gurbani such beautiful way that sangat will cherish lifelong. Wahe Guru Ji ka Khalsa Wahe Guru Ji Fateh. Many Thanks Pradeep ji for appreciating our Gurbani Keertan. I would keep in mind to add this Shabad in our future projects. This is indeed a beautiful Hukam. 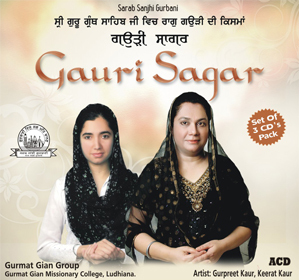 Do keep visiting this site to enjoy Gurbani Keertan. To learn Gurbani Kirtan one has to learn music. Ideally one must learn the basics of Indian Classical Music. You’ll have to find someone nearer to your place. 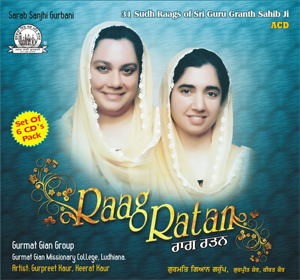 I do teach Raag based Gurbani Keertan at Gurmat Gian Missionary College at Ludhiana. Do keep visiting as we keep added new shabads frequently. I have heard shabad sung by you . I am overwhelmed to listen to them. You have got a very good voice. This website is indeed very good. Thanks Manjeet Kaur for appreciating our singing. Keep visiting here as we keep adding new shabads frequently.